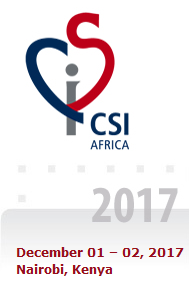 CSI Africa 2017 will take place on December 1 – 2, 2017 in Nairobi, Kenya. Please join us for an overview of catheter interventions in congenital, structural and valvar heart disease in children and adults. The meeting is designed for adult and pediatric interventional cardiologists, cardiothoracic surgeons, anaesthetists, imaging specialists & colleagues of other disciplines, such as nursing staff, who wish to know more about this field. CSI Africa will provide a forum for physicians from Central Africa, with an opportunity to exchange ideas and learn from each other. A large proportion of the faculty will be local and the scientific program is designed to address issues and topics specific to the region. The CSI Foundation provides access to a mailing list for all those who attend CSI Africa in order to encourage cross-continent dialogue and networking, even after the meeting. By involving government representatives in this congress, it is the aim of the CSI Foundation to bring better awareness to the government officials and to promote the development of infrastructure and treatment options for patients in Central Africa. A highlight of the program will also be a debate on the future development potential for the medical device industry within the region.